Final design of the package, front and back. Sketches of acouple design options. Sketches of a few more designs. Ticklebelly Desserts makes delicious innovative desserts from scratch in a magical facility filled with humans toiling away with sugar, flour and frosting. These folks also work with giant kitchen tools like a colossal batter mixer, it's like a present-day depiction of Willy Wonka's Chocolate Factory! The Ticklebelly product and marketing team was tasked to create a product line extension for Sams Clubs freezer aisles. In the eyes of the marketing team that product line needed a packaging design that was the sophisticated and upscale counterpart to other Ticklebelly products. When Brownie Bites were born, I was called in to do the job and I gleefully rolled up my sleeves. I rendered hand drawn sketches to gauge the temperature of my new clients (with detailed notes and rationale). Clients changed the name to Brownie Babies then selected the favorites and I moved on to the digital phase of design. With final designs approved I then developed concise art direction for the photographer, at the shoot we only had four hours to capture the brownie bites in all their delight so we moved fast working with pre-styled goodies. I finalized the artwork and prepared the files for final production. 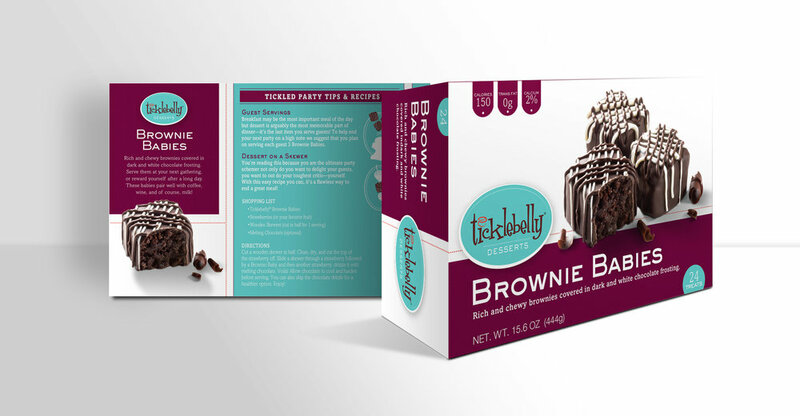 The final results proved to be successful for our clients and their buyers in promoting the treats in an elegant way while elevating the Ticklebelly brand.